Whenever people ask me where I went to college I get the same confused question every time: You went to an Ivy League school to learn how to sew? Contrary to what I thought I would be studying when I applied to Cornell, the focus of the major during my tenure was on functional apparel design. In fact, the word "fashion" was not allowed to be used anywhere in the curriculum's literature. While patternmaking and draping were required so were chemistry, economics, and math. Looking back, the more fashion-oriented courses merely served to provide us with the skills to design and develop things like deep-sea diving equipment or biohazard protective suits. I had to use most of my electives to take costume design classes in the Theater Arts Department so I could actually learn how to sew. I had never heard of WWD, no one ever mentioned "inspiration" or taught us how to do creative research, and I certainly didn't graduate with a high-end portfolio to show on interviews. The kinds of jobs I was recruited for were with huge consulting firms working on government contracts for things like the "Soldier System" for the year 2000. About ten years ago, the department decided to re-position itself to be at the forefront of fashion education and changed the name to Fiber Science and Design (FSAD); a change I found puzzling since it seemed not to reflect their new initiative. A few weeks before my bilateral mastectomy I met with the department's new chair, Jintu Fan, who wanted to know how alums currently working in the fashion industry felt if the department perhaps changed its name once again. Enrollment in the major has been way down apparently and as part of the College of Human Ecology, one of Cornell's state contracted colleges, he feared the future of the department could be in jeopardy. The thinking was that a strategic name change, specifically using the words "Fashion Design," would make the program sound sexier, garner publicity, and entice more candidates to apply; therefore keeping funding intact and preventing the department from being folded back into Design and Environmental Analysis (DEA) from which it was birthed in the 80's. HUMEC's main building, Martha Van Rensselaer, has just completed a mammoth renovation which now includes state-of-the-art labs, designated design and drawing studios, and a modern gallery space to display student and faculty works. The new facilities are a calling card for the revamped major where high-fashion is very much the focus now. They've also recruited some excellent professors who are teaching students how to parse the nuances of clothing design. This is an entirely different program from the one I graduated. Of course, Professor Fan could not have known what was going on in my personal life but I couldn't help think that they were missing a huge opportunity. It seemed to me they needed to stop getting caught-up in semantics and instead, carve out a more own-able niche. So while I told him that I agreed his plan would most likely work, I also told him that I wished the department would take a different approach; one which would draw upon the program's roots but merge today's demand for good design and aesthetics with creative problem solving. Let's be honest, while my pulse quickens watching a Dries Van Noten runway show, no one needs another beautiful dress; the Cornell name should really throw it's weight behind a more meaty endeavor. I've read a lot of blog posts since "Pinktober" began with people lamenting the pathetic lack of progress in research over the past 30 years and that all of the meaningless junk foisted upon the public to make us "aware" of breast cancer is a diversion from what is actually needed. Who isn't aware at this point? What we DO need more of is SCIENCE and RESEARCH. What we DON'T need more of is pink crap clogging-up landfills. So why did I write all this? 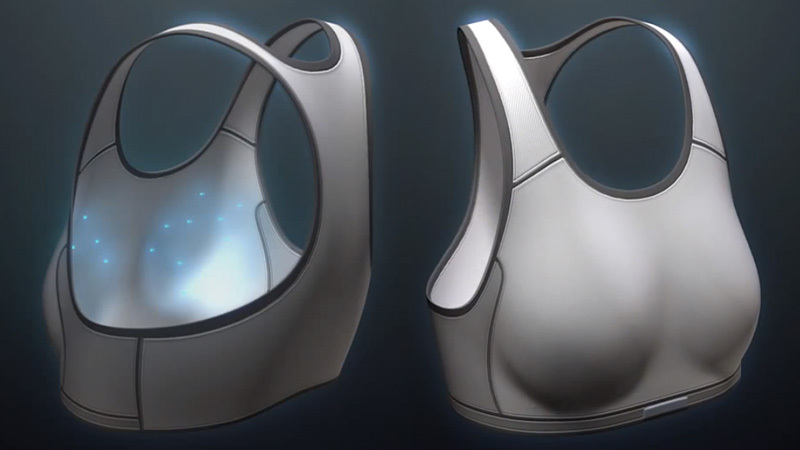 Because of this awesome sports bra created for First Warning Systems by Dr. Elias Siores of the UK's University of Bolton which not only can detect cancer in a non-invasive way, it can do it about 6 years earlier than any mammogram or imagining equipment that currently exists. This bra could potentially revolutionize the way women are screened and obliterate barriers set-up by Republican policy wonks and insurance company mandates as to who is eligible for testing. This is the kind of "awareness" that actually makes a direct difference in saving someone's life and empowers women to take charge of their own health. The bra employs a special microwave antennae system knit into the fabric which collects and monitors changes in cell temperature and blood flow over time. When the information is uploaded to the internet a fancy algorithm analyzes if these changes are caused by new blood vessel growth, which is often an early indicator that a cancerous tumor may be present. Results can be delivered to your computer or even your smartphone and if they show something suspicious, this bra will literally have you running to your doctor to check things out further...stat! All this product needs is a great color palette, a compelling array of coordinating items, and a fierce marketing campaign and it could be the next Lululemon. In fact, I'm designing a pair of gloves right now which have a silver conducting thread twisted into the yarn enabling you to use your smartphone in the cold without ever having to take the gloves off. I assure you they are not only functional but cool and handsome as well. I'm only doing them for guys right now (sorry) but I could certainly see these as part of the same brand. So, my dear alma mater, call the program whatever you want but this is exactly the kind of cutting-edge fashion Cornell grads should be creating. I really like this bra. I was skeptical making the purchase online, but I am glad I did. It fits me better than any bra I have purchased before. I have owned it for a few weeks now, and I have since purchased barely there bras more. There is some bounce, but it is not the uncomfortable kind of bounce. I do recommend ordering on the low size of what you normally wear as other reviewers have suggested. I did so, and I'm glad. It has a high neck, but that is a price I was willing to pay for good support while I get my plus size behind moving! Wacoal and "Fit For The Cure"
Cool Girls Get Cancer Copyright 2012 . Powered by Blogger.